When yeasts have fully metabolized the glucose and fructose content in must to carbon dioxide and ethanol, and the alcoholic fermentation is therefore said to be complete, one of the main problems to be tackled by a winery is how to ensure the biological stability of the product. When the primary fermentation has completed, the wine is actually quite “fragile”, so that lacking preventive measures to the contrary, undesirable organoleptic drifts may occur. 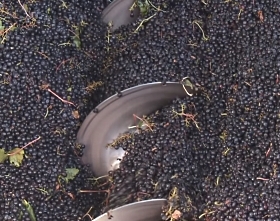 One of the most important processes impacting biological and organoleptic stability in wine is the so-called malolactic or secondary fermentation. Through this process, the wine sheds acidity, grows smoother and acquires more complex, mature flavours. Pediococcus, Lactobacillus and Oenococcus Oeni are among the several bacterial strains responsible for malolactic fermentation commonly found in wine. During the alcoholic fermentation, these microorganisms are kept in a latent state by the thriving yeast biomass; otherwise, the coexistence of yeasts and bacteria would compromise the organoleptic development of the wine, since it would involve an increase in acetic and D-lactic acid, a phenomenon known as piqûre lactique or lactic taint. When fermentation proceeds optimally, the alcoholic fermentation dovetails into malolactic fermentation, during which stage the L-malic acid is consumed and converted into L-lactic acid. Lactobacteria also degrade citric acid synthesizing the diacetyl molecule, which, if present in the correct concentration, enriches the wine with pleasing buttery notes and improves its bouquet. Several factors influence malolactic fermentation, among these: temperature (the optimum range being between 20 and 22 Celsius degrees), sulphur dioxide concentration, which if too high may compromise the lactic bacteria metabolism and hence impair malolactic fermentation, and wine acidity. A high degree of acidity, with pH below 3.2, may compromise the successful activation of the whole process, making an accurate pH determination crucial to the proper management of malolactic fermentation. Why prefer CDRWineLab® rather than the traditional methods of fermentation control? CDR WineLab® relies on the same spectrophotometry technique used in certified laboratories. L-malic and L-lactic acids are assayed through reference methods based on enzyme assay, and unlike traditional methods, the system we developed optimises the analytical procedures making them faster and simpler; there is no need of a trained technician. 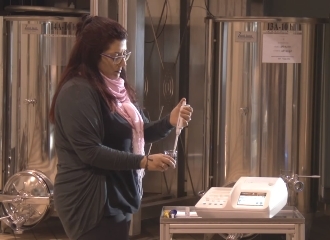 Being able to perform autonomously a real-time estimation of L-malic acid concentration enables wineries and oenologists to know precisely the progress of the malolactic fermentation process, with no need to wait for test results from external laboratories. Having at one’s disposal a reliable method such as CDR WineLab® to tailor the management of the winemaking process is undoubtedly a very important asset in ensuring the quality of the wine. Subscribe to the newsletter and get News, Guides and other Articles about analysis of wine and must and improve your winemaking process. Malolactic fermentation – Having the right chemistry in winemaking was last modified: March 8th, 2019 by CDR s.r.l.